As a new school year quickly approaches, many consumers are beginning to plan their back-to-school shopping trips. 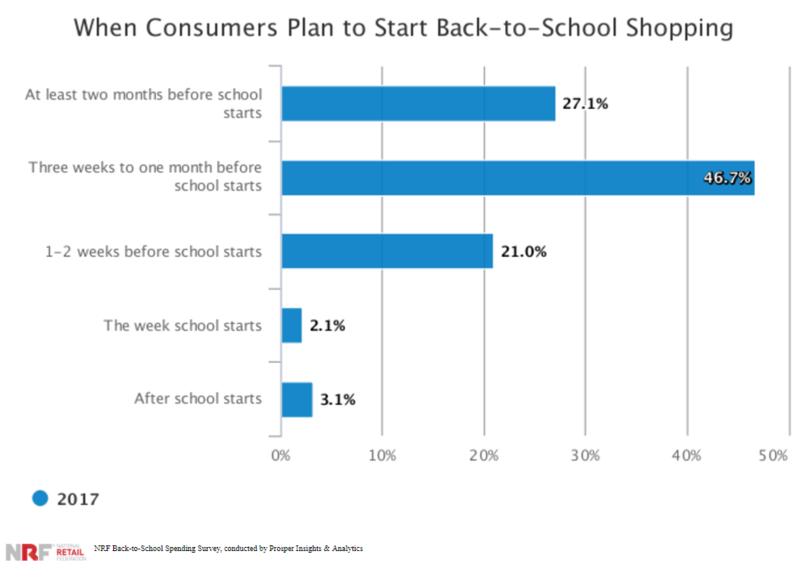 • When are consumers spending on back-to-school shopping? • What are they buying during back-to-school season? • Where do consumers typically spend their dollars? Here are a few insights to help your business plan how to maximize opportunity to capture back-to-school dollars. When are consumers spending on back-to-school shopping? This window of time is important to consider when determining how to market to shoppers during the back-to-school season. For local and regional stores, and to leverage local store marketing tactics, pay attention to K-12 schedules and college start dates to adjust your sales accordingly. As NRF found that most shoppers begin at least three weeks out from school start dates, you can plan operations accordingly and begin promotions around this time to encourage shoppers to choose your store as they’re making their trips. What are consumers buying during back-to-school season? While traditional school supplies are an obvious item on everyone’s back-to-school list, more retailers are finding shoppers are picking up additional items when they are making the rounds. For college-bound shoppers, NRF found that electronics, apparel, and food are the top three spending categories, ahead of school supplies. Where for the K-12 group electronics take a close second to apparel items, with both pulling in more revenue than school supplies, too. Retailers can use this information when planning displays and determining what items will be a good fit for promotions and advertising. Not a back-to-school retailer? Find out which nearby retailers may attract back-to-school shoppers and create promotions to attract shoppers to your retail store or restaurant while they’re out and about. Start marketing a few weeks in advance, so you’re top of mind when it’s time to buy. Where do consumers typically spend their dollars? Back-to-school shoppers are following the same trends seen in other retail sectors as they are drawn to more economic options and convenience. More than 50 percent of shoppers plan to buy items at discount stores, and 45 percent plan on using online retailers to get their goods. To succeed with online shoppers note that 90 percent of consumers will weigh free shipping options more favorably, while 54 percent are hoping to take advantage of click and collect options when purchasing their goods. How can you reach more customers during back-to-school season? Knowing when, where, and how consumers plan to shop is only half the battle when trying to maximize revenue during back-to-school season. Use customer analytics insights to target the customer most likely to shop at your store and reach them with targeted marketing campaigns.